There was a toy show in town this weekend so I took the kid and spent a few hours roaming aisle after aisle knee deep in GI Joes, Transformers, He-Man and Hot Wheels. My kid scored a few Barbie dolls while I found myself a few mainlines I didn't have in fantasy league collection. My kid loves Ghostbusters and likes to race with me as much as she likes her Barbie, so when she spotted a Slimer Bread Box, we couldn't pass it up. Also found this weekend, in the wild at Meijer, were a Skyline I figured I'd never get along with another Datsun wagon (can't have enough of them). Just picked up 10 of these FTE '70 Plymouth Superbirds. I won a nice 30 car lot of NASCAR 1/64 scale cars to use on upcoming races! 2017 Matchbox L Case Has Arrived! Love them Lakesters but I can never keep the wheels from getting bent! Its like they have paper for axles. The FTE Superbird haul....4 will be kept Stock...2 will be Modified themselves and 4 will be donors for other cars, one is another Superbird I've had that's not good...so going to see if I can make a decent car outta it now. 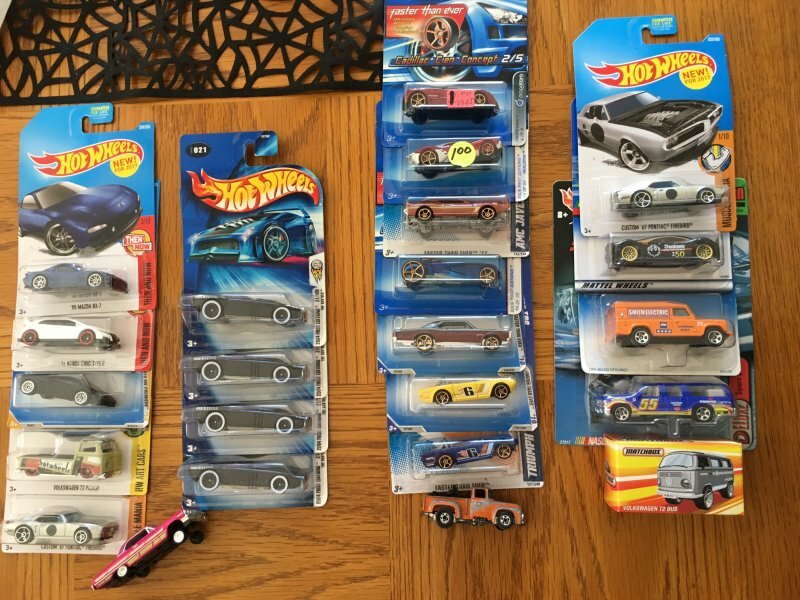 $12.50 with Free Shipping....basically $2.10 per car...6 cars...2 Ferrari 458 Italia's FTE included were the target cars. Still need one in the blister pack, but I've got one to modify now....hard to find car. Hot Wheels Redlines Army Staff Car At Thrift Store!